Nonsurgical spinal decompression relieves lower back, neck pain. With inmates outnumbering them by a two-to-one margin, the job of a corrections officer has long been considered one of the most dangerous occupations in the United States. Don Wenner can tell you firsthand just how dangerous that job really is. In 2000, Don was working in corrections at the Northampton County Prison in Easton, Pennsylvania when a fight involving several inmates broke out inside the facility. Don was among the corrections officers tasked with trying to break up the fight. “There were about seven hundred and fifty inmates in a facility built to house three hundred and fifty at the time, so there were situations that had to be handled all the time, and this just happened to be one of those times where I took on too much weight trying to pull one man off another,” Don explains. Don herniated two lumbar discs during that incident, then spent a month trying to cure the problem with physical therapy. Physical therapy only made the situation worse, however, which prompted his doctor to prescribe a series of other potential remedies. The final option was surgery, which Don had in December of 2000. Less than a week after undergoing surgery, however, Don injured his back yet again, this time in an automobile accident in which his car took a hard hit from behind. That forced Don to undergo a second back operation in early 2001. 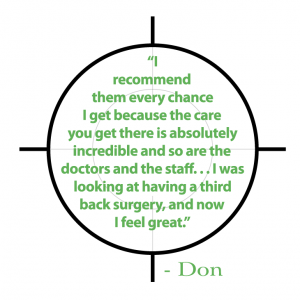 The two surgeries did what all the other treatments could not, which was rid Don of his debilitating back pain. The relief was not quite permanent, however. 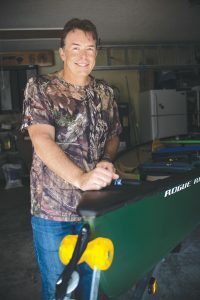 In 2017, long after Don had transitioned out of the corrections community and into a real-estate job that brought him to Florida in 2010, back pain the likes of which Don had never experienced before began to cut into his daily routine. “It was in the spring that I started getting this crazy pain in my back that ran all the way down my left leg, and it just wouldn’t let up,” Don informs. “I usually walk my dog about a mile and a quarter every morning, but I was in so much pain that I couldn’t do that. An MRI ordered by the orthopedist showed that in addition to having arthritis in his back, Don, then 49, had a severe case of spinal stenosis, which is a narrowing of the space for the spinal cord that puts pressure on the nerves and causes pain. St. Augustine Spine Center’s goal is to help patients suffering from severe and chronic back pain, neck pain and peripheral neuropathy return to a pain-free, active lifestyle using the most advanced nonsurgical, drug-free procedures available. 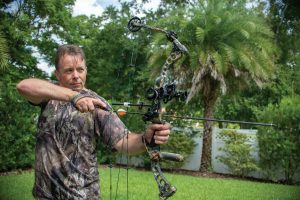 “Don first came to see us here at St. Augustine Spine Center in April 2017, and at the time, his main issue was pain in the lower back that radiated down into his left buttock and the back of his left leg,” Tyler Albrecht, DC, explains. “The MRI showed he had two bulging discs as well as bone spurs that were causing the spinal stenosis. That resulted in the sciatica pain that was going down the leg. Spinal decompression is a pain-free, FDA-cleared treatment that works to restore herniated or bulging discs to a healthier state, thus relieving pain. The decompression procedure works by reversing the pressure on the injured discs, allowing them to heal rather than just trying to cover up the pain with injections or medications. “Our decompression table does this by gently pulling the two vertebrae on either side of the affected disc, producing a vacuum effect,” Dr. Albrecht informs. “This allows bulging material and nutrients to be drawn back into the disc over time, which allows it to rehydrate and heal naturally. “Dr. Albrecht did a great job of explaining how the spinal decompression procedure works, and it sounded to me like a great alternative to spinal fusion, so I signed up for the treatment,” Don recounts. Patients placed in a spinal decompression program are treated three times a week for about seven weeks. Each decompression treatment lasts about 30 minutes, after which most patients are treated with a combination of other modalities that are part of the disc rehabilitation program at St. Augustine Spine Center. Those modalities include manual therapy, rehabilitative exercises, chiropractic care, ice, electrical stimulation and laser therapy to help speed the healing process. The only thing greater were the results. After only a week of treatments, Don was already feeling less pain in his lower back, buttock and left leg. By the end of June 2017, he was pain free and was only visiting the spine center once a month for maintenance. “He really did have a great result,” Dr. Albrecht confirms. “When we first started treating Don, he had a thirty-six percent disability score and pain going up to seven on a scale of one to ten in his lower back and left leg. With his back and left leg pain gone, Don began the summer of 2017 by re-establishing his old routine of walking his dog in the morning and walking three miles or more later in the day. Within a year, however, another problem developed. “It was in late February of this year that I started to get this strange feeling in my right arm,” Don reveals. “It was almost like I was grabbing an electrical wire with my right hand and was getting an electrical shock sensation up my forearm and into my shoulder. “It felt like electricity was running up and down my right arm, and the arm would just go completely numb. It was like when your arm falls asleep except this was numb to the tenth power because my arm would just go completely dead. As soon as he returned from his eight-day vacation to Aruba, Don called Dr. Albrecht, who suggested he get an MRI done on his neck. When the MRI came back, even Dr. Albrecht was surprised by what it revealed. “Don had mentioned a time or two while he was coming in for his maintenance visits for his back that his neck was a little stiff, but it didn’t seem as if it was anything major,” Dr. Albrecht says. “Then we got the MRI results. Based on how well Don responded to the spinal decompression therapy he had on his back, Dr. Albrecht recommended Don undergo the same treatment on his neck. “For the lower back treatments, you’re strapped in fairly tightly with a set of braces around your hip bone,” Don explains. “With the neck, you’re not strapped down tight like you are for the lower back treatments. Don says the treatments for his neck were as subtle and relaxing as they were for his lower back. They were also equally effective, though reaching the point where he was pain free took a little longer than it did for the back treatments. The laser therapy Dr. Albrecht added to Don’s treatments was performed with a K-Laser, which uses red and infrared light to stimulate tissue repair and growth. It’s a therapy used regularly nowadays by trainers treating professional athletes. “Once Dr. Albrecht started using the laser, it made a big difference,” Don discloses. “After that, I got to the point quickly where I was no longer having any of those episodes with my arm and shoulder, and my back continues to feel great as well. Don says he’s fortunate he found St. Augustine Spine Center and is so grateful for the treatment he received from Dr. Albrecht that he makes a habit of recommending the practice to anyone he comes across who is having back or neck problems. 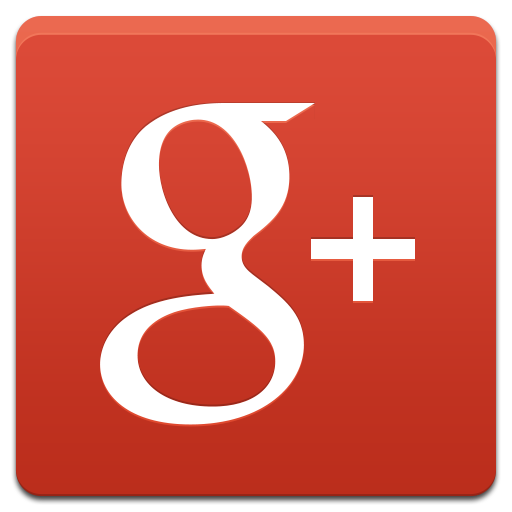 “I recommend them every chance I get because the care you get there is absolutely incredible and so are the doctors and the staff,” he enthuses. “I mean, I was looking at having a third back surgery, and now I feel great.